This Wednesday night’s game was a study in deflated expectations for the Winterhawks. Less than five minutes into the second period, Oliver Bjorkstrand put in a goal that sealed the 4-1 lead over the visiting Calgary Hitmen. Alas, the organization and teamwork that characterized the first half of the game crumbled in only a handful of minutes. After giving up three goals in a row in regulation, Portland lost in overtime 5-4. What could possibly account for such a drop-off? Well, it may have something to do with the performance in the net…on both sides. Coach Kompon must have been eager to shake out the cobwebs on the defense, since he started newcomer Evan Johnson against his former team. 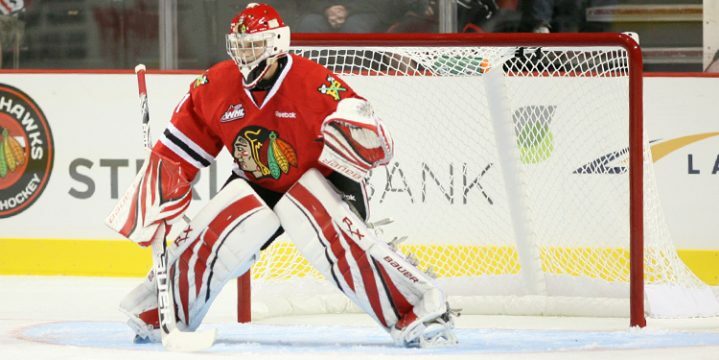 Likewise, Calgary started veteran goalie and former Winterhawk Brendan Burke. Johnson made a good showing considering the help he was given. Calgary only managed 38 shots on goal total, and this was only his second game playing for Portland. Quite frankly I’m surprised he was given the starting slot for this game as opposed to the Thunderbirds and Americans bouts coming up. I suppose there’s something to be said about these two knowing their former teammates well enough to defend effectively against them. Interestingly, this gambit was working perfectly for the Hawks and dismally for the Hitmen going into the second period. It was right after Bjorkstrand’s goal that Burke was replaced in net by Mack Shields, who lived up to his name and did not allow another Winterhawks goal for the rest of the game. Outside the goalie strategy, there seemed to be a Jekyll-and-Hyde disconnect between the offense in the first half of the game and the one we saw in the second. The game started with a goal from the point, a strong forecheck, an odd-man rush, and strong cross-ice passes that all yielded goals. This was the Winterhawks offense that we’ve been waiting all season for, and that we know they are capable of. None of that hockey mastery showed up after the media timeout in the second period. Suddenly we were watching the Winterhawks from back in October again: lone-wolf rush attempts, an inability to cross the neutral zone, and a general lack of hustle in their own defensive zone. Regardless of this uneven performance, their wins earlier this week have secured the Winterhawks as the third team in line for the Western Conference playoffs. They remain two points behind the Everett Silvertips and a whopping 21 points behind the Kelowna Rockets. Fortunately, they have a real softball week ahead of them with plenty of opportunity to rush out ahead if they only seize it. This Saturday and next Friday see the Hawks battling the Seattle Thunderbirds (with a solid six days of rest and practice time in between) and a tune-up game against the bottom-of-the-division Tri-City Americans next Saturday. After that, it’s no more lying in the weeds. They finish out the regular season with an almost constant barrage against Spokane interspersed with the rival Silvertips and one against Prince George. Which version of the Winterhawks show up to those games will determine their actual chances against the real competition once the playoffs start.